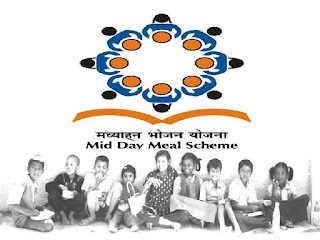 The Mid-Day Meal Rules, 2015 are notified by the Central Government on 30th September 2015. The National Food Security Act, 2013 contains provisions related to welfare schemes including Mid Day Meal Scheme. 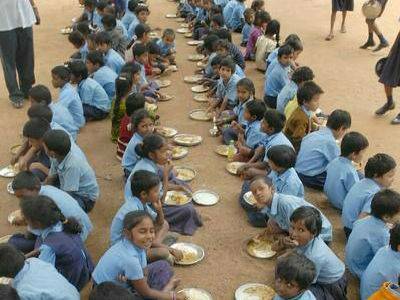 In accordance with the provisions of the Act, the Ministry of Human Resource Development (HRD) has finalized the Mid-Day Meal Rules after consultation with the States and other related Central Ministries. Mid Day Meal Scheme - The Midday Meal Scheme is a school meal programme of the Government of India designed to improve the nutritional status of school-age children nationwide. The programme supplies free lunches on working days for children in primary and upper primary classes in government, government aided schools. 2. To encourage children from disadvantaged backgrounds to attend school regularly and help them concentrate in school activities. 3. As well as provide nutritional support to students in drought- ridden areas throughout summer vacation. 1. Entitlements of children: Every child within the age group of six to fourteen years studying in classes I to VIII who enroll and attend the school, shall be provided hot cooked meal having nutritional standards of 450 calories and 12 gm of protein for primary and 700 calories and 20 gm protein for upper primary free of charge every day except on school holidays. The place of serving meals to the children shall be school only. 2. Implementation of the Scheme: Every school shall have the facility for cooking meal in hygienic manner. Schools in urban area may use the facility of centralized kitchens for cooking meals wherever required in accordance with the guidelines issued by the Central Government and the meal shall be served to children at respective school only. 3. Responsibility of School Management Committee: The School Management Committee mandated under Right to Free and Compulsory Education Act, 2009 shall also monitor implementation of the Mid-day meal Scheme and shall oversee quality of meals provided to the children, cleanliness of the place of cooking and maintenance of hygiene in implementation of mid day meal scheme. 4. Utilization of School Funds: The Headmaster or Headmistress of the school shall be empowered to utilise any fund available in school for the purpose of continuation of Mid Day Meal Scheme in the school in case of temporary unavailability of food grains, cooking cost etc. in the school. The utilised fund shall be reimbursed to the school account immediately after receipt of mid day meal funds. 5. Testing of the meals by Accredited Labs to ensure nutritional standards: Hot cooked meal provided to children shall be evaluated and certified by the Government Food Research Laboratory or any laboratory accredited or recognized by law, so as to ensure that the meal meets with the nutritional standards and quality. 6. The Food and Drugs Administration Department of the State may collect samples to ensure the nutritive value and quality of the meals. The samples shall be collected at least once in a month from randomly selected schools or centralized kitchens and sent for examination to the accredited laboratories. (b) Cooking cost prevailing in the State. (i) In case of non-supply of meal by the Centralised Kitchen, the Food Security Allowance shall be realised from the Centralised Kitchen as stated above. (iv) The State Government shall take action to fix responsibility on the person or agency in accordance with the procedure laid down, if mid day meal is not provided in school on school days continuously for three days or at least for five days in a month. (v) Wherever an agency of Central Government is involved, the State Government shall take up the matter with Central Government which shall resolve the matter within a month.